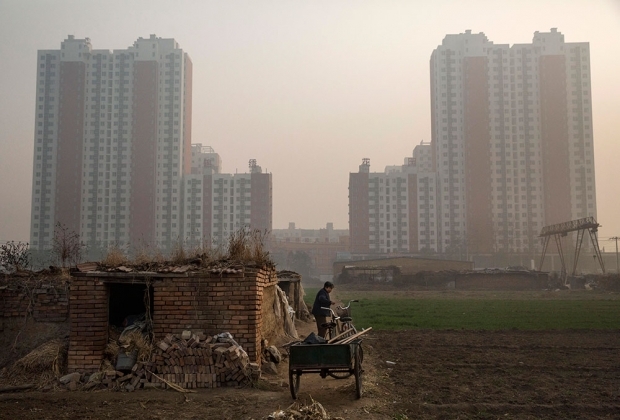 A farmer stands outside her home, with a new housing development in the background, in Hebei on the Beijing outskirts. Luigi Tomba, expert on municipal government in China, fellow at the Australian Centre on China and the World, and author of the book The Government Next Door: Neighborhood Politics in Urban China, is this week's Sinica Podcast guest. Since 2005, Luigi has also been the Co-Editor of The China Journal, a well-known academic journal on Chinese affairs. We're delighted to have Luigi since it gives us an excuse to talk about the property market, without obsessing over real estate speculation and prices per square meter. Instead, after starting with a look at the emerging middle class in China, we move on to talk about Luigi's ideas on how China's property revolution and the dismantlement of the danwei system has counterintuitively ended up strengthening rather than weakening the government's ability to control its citizens on a local level. We also look at how China's shift to community-based governance structure has improved the image of the Party at the grassroots level.